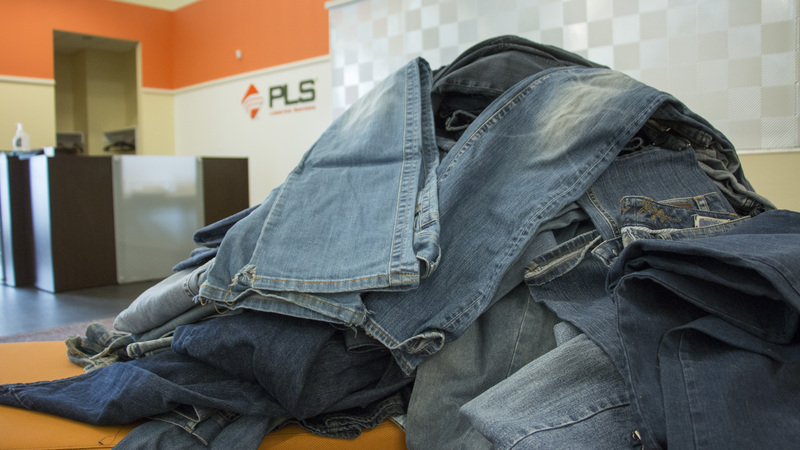 CRANBERRY TOWNSHIP, PA--(Marketwired - July 12, 2016) - PLS Logistics Services ("PLS"), a leading provider of technology-enabled transportation management and freight brokerage services, has collected and donated denim to the Blue Jeans Go Green™ denim recycling program. Employees recycled their old blue jeans, jackets, shorts and skirts, which will be turned into natural cotton fiber insulation. PLS collected 100 pairs of blue jeans over two weeks. "We're excited to participate with the Blue Jeans Go Green™ program. Our business is about sustainability and we are pleased to support this worthy cause," said Greg Burns, President of PLS Logistics Services. "PLS employees have donated to the program, and are enthusiastic to provide transportation services at cost to participating firms involved in the program." Since 2006, the Cotton Incorporated Blue Jeans Go Green™ program has helped rebuild communities by providing hundreds of thousands of square feet of UltraTouch™ Denim Insultation to Habitat for Humanity affiliates around the country. PLS Logistics Services is a leading provider of logistics management, brokerage and technology services for shippers across all industries. PLS handles millions of loads annually across all major freight modes: flatbed, van, LTL, rail and barge, air and ocean. The PLS carrier network consists of over 20,000 trucking companies along with Class-1 railroads and major barge companies. PLS has been recognized as a top 25 freight brokerage firm. To learn more visit www.plslogistics.com. For more information about the Blue Jeans Go Green program and to learn how to get involved, please visit www.BlueJeansGoGreen.org. PLS Logistics employees collected and donated denim.